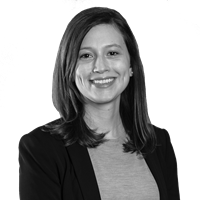 Jessica concentrates her practice on environmental, litigation, airport and municipal matters. She has litigated matters in both federal and state courts for private and public sector clients. Jessica has advocated for clients before numerous federal, state and local authorities, including the U.S. Army Corps of Engineers, the Federal Aviation Administration, the Massachusetts Department of Environmental Protection, and local conservation commissions and zoning boards of appeal. She also maintains an active pro bono practice. In her environmental practice, Jessica frequently works with a national utility to help them navigate the permitting of complex energy infrastructure projects in New England. In addition, Jessica advises a non-profit environmental group regarding a large tidal restoration project, and helps clients assess various waterfront permitting and planning concerns. Jessica is an integral part of the Massachusetts Gaming Commission litigation team. The team the represents the Commission in claims related to the proposed casino in Everett. Jessica also advises the Commission on other gaming issues throughout the Commonwealth. In addition to her environmental and public law work, Jessica is frequently part of teams that counsel airport owners on federal regulatory and grant compliance, as well as Part 13 and Part 16 proceedings before the Federal Aviation Administration. She was recently part of the team that represented the City of Los Angeles in its successful defense of “labor peace” requirements at Los Angeles International Airport. Panelist, Speed Networking with Environmental Lawyers, Boston Bar Association, February 2019. Panelist, CLE: Environmental Standing, Part 1, Boston Bar Association, December 2018. Panelist, Administrative/Regulatory Law, Boston University School of Law Career Conference, October 2018. Panelist, Energy & Environmental Law Society, Boston University School of Law, 2017. Jessica Wall and Travis Godwin, Seventh Circuit Takes a Second Look at CERCLA Liability after EPA Settlement, American Bar Association Journal of Real Estate Litigation and Condemnation, Winter 2014. Jessica lives in East Boston with her husband. In her spare time, she can be found cooking, reading, practicing yoga, or hiking in the National Parks. Before law school, Jessica worked for WBUR-FM public radio, WBUR-FM in Providence, and a record label.